BG Signature, a luxury vacation real estate collection with destinations around the world, recently announced their one-year corporate anniversary. Following their launch in 2013, the BG Signature collection of luxury retreats is proudly serving an exclusive client base and delivering high-end vacation experiences to customers across the United States, Canada and Europe. “In 2014, BG Signature has enjoyed a thrilling year of bringing our exclusive services to clients, developing new relationships and seeing our properties flourish,” said Bobby Genovese, BGSignature owner and founder. “We are eager to continue improving our core services that now include luxury equestrian weddings, polo programs, élite concierge services and more,” he added. One year later, the company continues to grow with the launch of their new website, www.bgsignature.com, which features every location in the collection along with stunning imagery, information on amenities and a detailed look at the many capabilities BG properties has in place to ensure the highest hospitality standards possible. 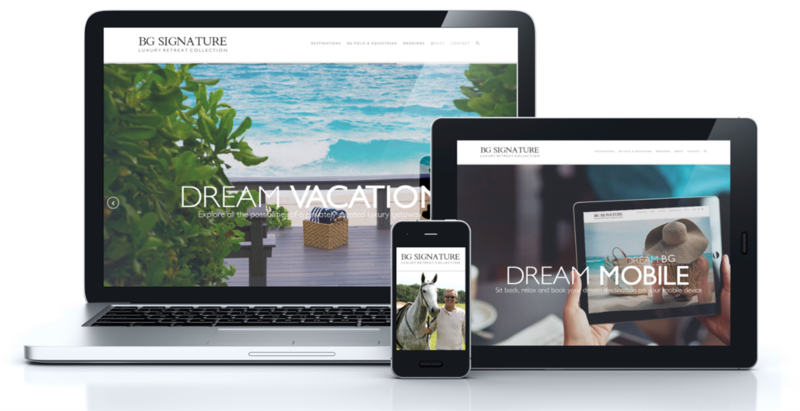 Visitors to the new website can also enter to win a 3-night dream vacation getaway to Paradise Island, Bahamas, where one lucky winner and 3 guests will enjoy BG Signature’s lavish Bahamian villa and a bonus trip to Blue Lagoon Island Dolphin Discovery. The entry period for the BG Signature One-Year Anniversary Giveaway begins November 19th and ends on December 5th. Visit www.bgsignature.com/dream-getaway to enter. The one-year anniversary also marks the launch of BG Polo & Equestrian, a collection of five teaching and competition polo centers for all skill levels in Florida, Canada and Argentina. Renowned polo player and British Open finalist, Max Secunda, leads the flagship location in Vero Beach, Florida, while international polo veteran Marcos Bignoli heads the Ocala Polo Club located at the newly restored Florida Horse Park adjacent to BG Equestrian Resort. “These programs deliver world class training as well as competition opportunities for our guests in multiple disciplines such as Hunter/Jumper, Dressage and Polo. Our goal is to be the number one Equestrian Facility in the area and local leader in education, training and events,” said Genovese. Highlighting the past year, BG Signature’s Ocala resort expanded with the addition of several local entertainment, dining and recreation venues that represent Genovese’s commitment to restoring key Marion County landmarks, including BG Downtown, Cowboys Saloon, The Coliseum, The Rock House Lounge, BG Sun Plaza, BG Ocala Civic Center and Wild Waters Water Park and Silver Springs State Park, home of the original glass bottom boat tours. With a very busy and prosperous first year completed, BG Signature will continue to develop their premium collection for the discerning traveler who appreciates luxury, magnificent landscapes and exquisite privacy. BG Signature is a collection of luxury destinations and amenities that include private estates in the United States, Canada, Bahamas, England and Argentina. A private yacht and jet complete the collection, which also features several polo and equestrian resorts. Located in some of the world’s most desirable settings, BG Signature is the ideal choice for your next vacation getaway, family reunion, corporate event or luxury wedding. Chosen for their unique and stunning landscapes, they have been hand selected and curated by the Genovese family for their stunning natural habitats. Visitwww.bgsignature.com to learn more.